I got these two items from my dad. 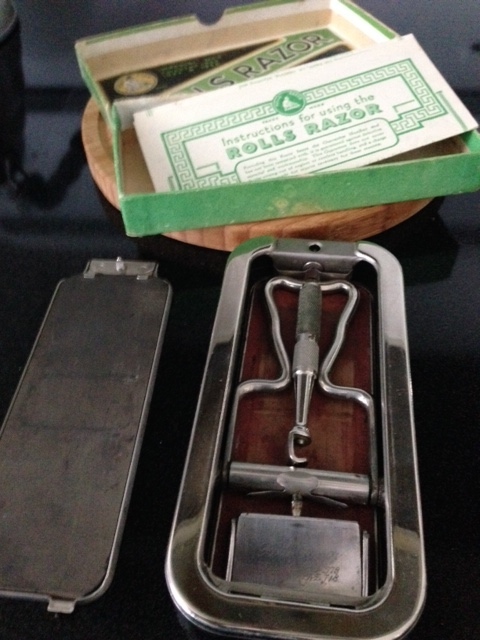 I don't know much about them but he's had them for over 50 years I think and I don't believe either item has ever been used. For some reason these two razors weren't stashed in dad's basement and thus escaped the flood a couple of years back. He lost most of his "treasures" in that flood and at 87 is unlikely to rebuild his collection. It was surreal hauling ruined, sewage sodden stuff out of his basement in laundry hampers and dumping it on the curb to be loaded into garbage trucks and hauled to landfill. That landfill will prove interesting to future archeologists I'm sure. If anyone knows anything about these two razors I'd be happy to hear it. I think they will be artifacts in my Museum of Shaving that I started upon receiving the two items. The Rolls razor looks weird. How do you even shave with that thing? The straight looks nice. Very carefully I think. I'll post some pictures with it assembled so you can get a better idea how it worked. You basically dragged a bare blade over your face, there's assort of a bar thing that you'd rest on your face but it doesn't cover any of the blade. The case has a stone on one side and a strop (leather) on the other and depending on which side of the case you opened you could hone or strop. Ingenious really but ultimately impractical and dangerous (IMO). (01-05-2016, 11:46 PM)wyze0ne Wrote: The Rolls razor looks weird. How do you even shave with that thing? The straight looks nice. (01-05-2016, 11:51 PM)Marko Wrote: Very carefully I think. I'll post some pictures with it assembled so you can get a better idea how it worked. You basically dragged a bare blade over your face, there's assort of a bar thing that you'd rest on your face but it doesn't cover any of the blade. The case has a stone on one side and a strop (leather) on the other and depending on which side of the case you opened you could hone or strop. Ingenious really but ultimately impractical and dangerous (IMO). Jeff and Mark, I believe Brian (ShadowsDad) has used one of these so he'd be the one to ask. I bought a NOS one in Falkirk, Scotland in September and it was only £10.00 (US$14.67, CN$20.52). I am fascinated by them but not ready to try one. To me, they are closer to a straight with a handle or, perhaps, a better description might be a lollipop straight. I have 14 Rolls Razors. It is still my favourite Razor. I have some knowledge of them but nothing encyclopaedic. I have restored most of them - a little bit or a lot. Although Rolls and everyone else always said if the hone is cracked or broken it must be replaced. A near impossibility 53 years after they ceased business. It is still common belief and one with a less than perfect hone may often be purchased quite cheaply. I have found an easy, inexpensive way to use them again as long as no hone pieces are missing. No special or costly tools are needed. I will try to answer any questions you might have. Yours looks like it is in good shape. 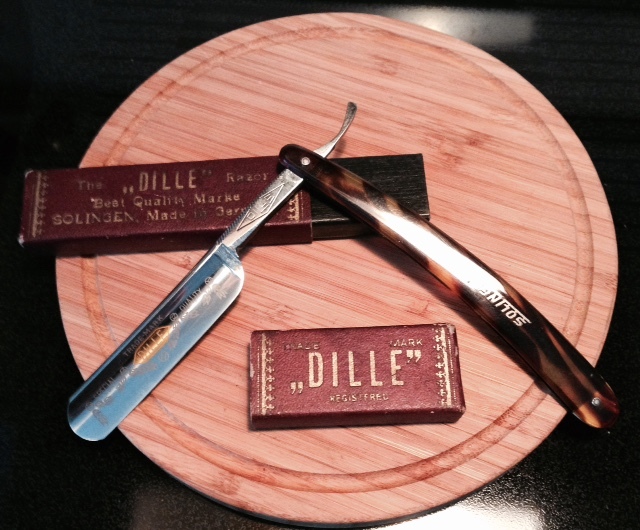 From what I can find, the Dille Straight razor is a Chinese made razor that has a reputation for replicating Solingen blades. I could not get an accurate vintage on them, though they seem to be 1930's time period. The Rolls Razor is neither vicious nor dangerous. The 'bar thing' protects the edge of the blade. The face really doesn't need protection from your ('bare Blade'). It really is quite practical considering the blade, if cared for, will outlast any of us here as well as our grandchildren. It requires less attention than a traditional cutthroat. 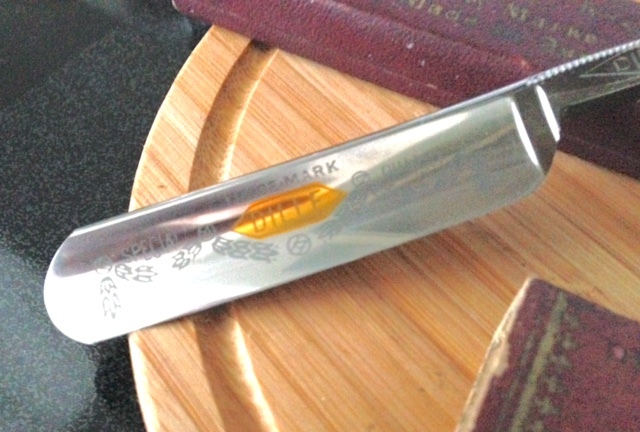 The blade is 1-1/2" length of a hollow ground stainless steel straight razor. Do not try to force close the case with the razor handle lying atop the sharpening handle as it seems to be in your picture. That is how most hones are broken. Depending on the model you may find yours will lie flat on the strop where you have it now or on a later model you may be able to tuck it under the edge of the case. If you can't get it write me. There are alternatives. I think your model is the Imperial. If you have the instruction sheet read it. If not I can email a copy. Thanks Mickey, I'll be sure to be careful with it. I still haven't developed a desire to actually use the device. I am currently satisfied with run of the mill DE razors and will keep this razor and the straight as historical artifacts representing specific periods in the evolution of shaving. Do you shave with all/some of your Rolls Razors an a regular basis?